The new rules basically rule out "big box" stores, although existing buildings larger than 50,000 square feet are exempt. FALMOUTH — The Falmouth Town Council has voted unanimously to limit the size of new stores in its Route 1 shopping district. The 50,000-square-foot limit is the first step in a campaign to reinvigorate the area, repave the highway and redesign the strip into a bustling village atmosphere where shoppers would park their cars and walk from shop to shop. 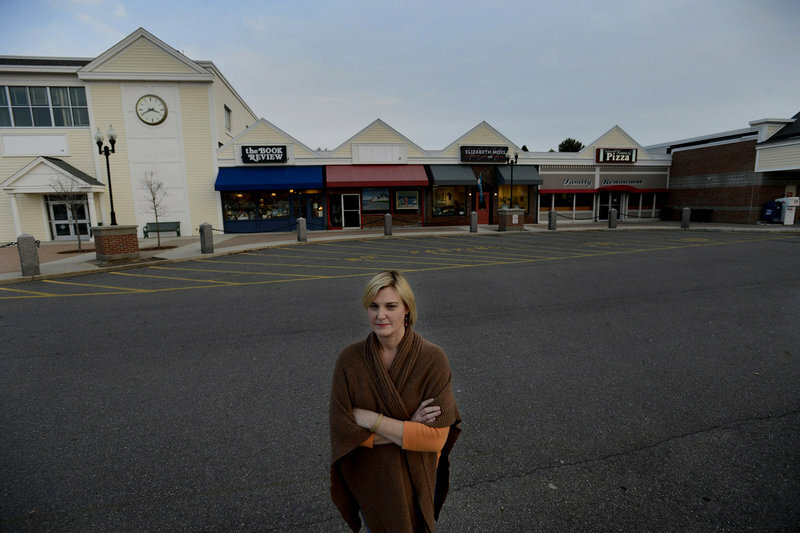 Donna Williams, owner of The Book Review in the Falmouth Shopping Center, said she is pleased that years of hand-wringing are over, and hopes the effort leads to a new anchor tenant for the center. Not all business owners in the center were as sanguine. Elizabeth Moss, owner of Elizabeth Moss Fine Art Gallery and Framing, said she believes the limits restrict options for potential future businesses. The new zoning law applies to ground-floor businesses in the one-mile-long retail zone between Bucknam Road and Route 88 that is currently home to a Walmart, a Shaw’s supermarket and the Falmouth Shopping Center, which has been beset by vacancies. The zoning changes are aimed at limiting the expansion of so-called big-box stores, and promoting a village atmosphere similar to other communities with historical downtowns. Falmouth officials plan to foster the intimate, navigable feel with a second layer of zoning laws that could be ready for public presentation by March. The ordinance represents a compromise from four months ago, when councilors discussed a 30,000-square-foot limit. Two councilors on the board, Tony Payne and Council Chairwoman Faith Varney, had as recently as October advocated for a cap of 90,000 square feet, saying the higher limit would encourage development and investment. The compromise — 50,000 square feet — is roughly the size of a typical Hannaford or Shaw’s supermarket. In an interview Tuesday, Varney said the higher limit would have lent businesses flexibility while still blocking the mega-chains deemed a poor fit for the area. “I believe the businesses need to set their own parameters,” she said. Exempt from the limitations are hotels, motels, public utilities, outdoor eating areas and outdoor sales areas, according to the ordinance. Existing buildings larger than 50,000 square feet will be allowed to expand to up to 60,000 total square feet without penalties. A proposal to expand the Walmart at 206 Route 1 from 92,000 to 124,000 square feet will be allowed to go forward because plans were submitted to the town before the ordinance passed the council. 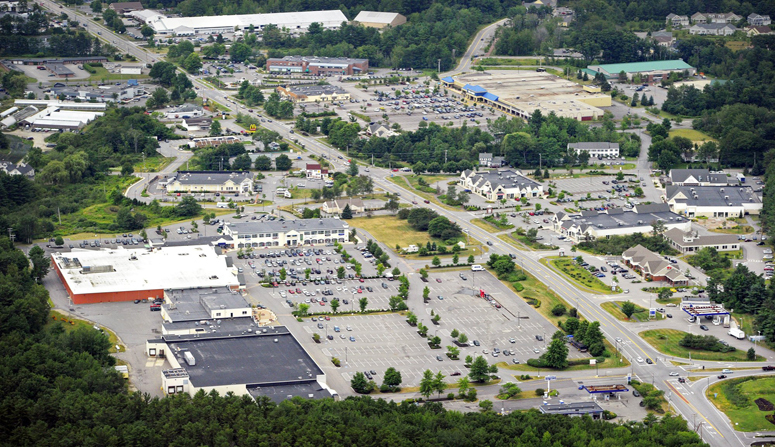 The Falmouth Shopping Center at 251 Route 1 has several vacancies, including a 52,000-square-foot former Shaw’s supermarket that has been empty since 2005. The shopping center had been for sale, and prospective buyers Ben Devine and a partner, WP Realty of Bryn Mawr, Pa., showed interest in purchasing the 216,000-square-foot property. But Devine apparently pulled out of the deal in early November. Devine said that although his option to buy expired, his interest in the property has not waned. The zoning is a new wrinkle in the equation, but was not the deciding factor to leave the deal on the table, he said.